Get Your FREE 2018/19 Touratech Catalog Here! The F800GS is designed with great ground clearance for off-road use, but unfortunately it can be too tall for most riders’ comfort. This set of lower shock and fork springs will effectively lower your motorcycle while also improving the handling and ride comfort. 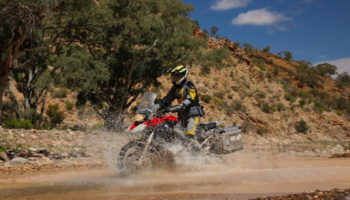 Not only will it lower your motorcycle, installing progressive springs will also give your F800GS a significant improvement in handling and braking, both on and off-road. The progressively wound springs for the front and rear suspension give you a plush ride at slow speeds, but when the road gets rough, or you decide to push hard in the corners, the springs are much firmer towards the bottom of the travel where you need it the most. Replacing your shock and front fork springs with our progressively wound lower springs is a less expensive alternative to having your suspension’s travel reduced and installing shorter springs. No modifications to your forks or rear shock are necessary to run these springs. They work by using a very soft spring rate for the first 1.4″ of travel, and a normal progressive rate for the rest, giving you a suspension system that is 1.4″ shorter under weight, but normal length unweighted.